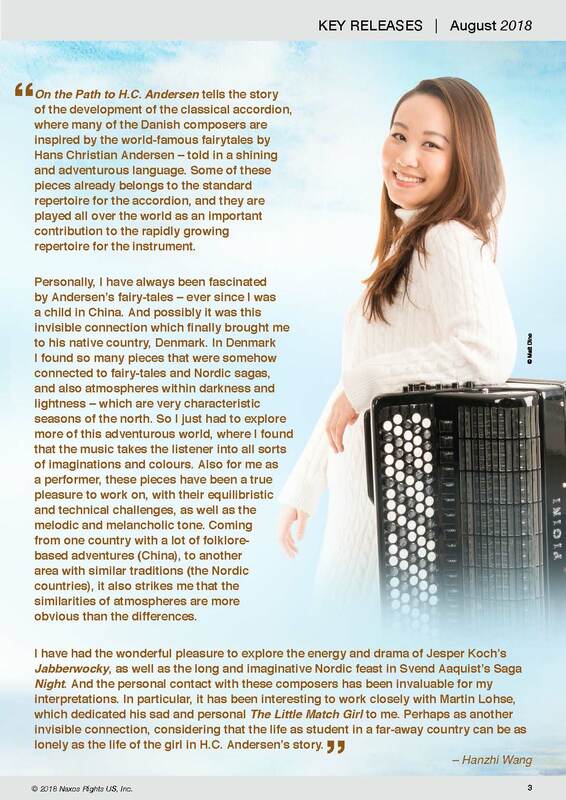 In August 2018, Naxos released its first-ever solo accordion album, Hanzhi Wang's “In the Path of H.C. Andersen.” The release features works by Danish composers that explore both the darkness and luminosity of Hans Christian Andersen's famous stories. We had the opportunity to speak with Hanzhi about her recent album, misconceptions about accordion music, and more. 1. How did you start playing the accordion? How did you decide to pursue a career as a professional musician? When I was about 5 years old, my father was sitting in the living room watching an Italian movie (I can't remember exactly which one). I heard several beautiful melodies played on the accordion throughout the movie (at the time, I didn't recognize the instrument). I was astonished by the unique sound, and I had never heard anything like it before. I asked my father, “What is this?” After a few weeks, I got my first toy accordion, included with a red, colorful box and only few buttons in the left hand. As with any other instrument, classical accordionists need academic education and professional training. However, compared with other traditional instruments, the accordion is still a very “young” instrument, so it has taken time to establish the instrument in the classical music world. As a result, there are not very many high level classical accordionist, and many do not know the true potential of the instrument. I was lucky to get in contact with teachers and academies from a quite young age. They were able to show me the possibilities within the classical side of the instrument. From then on, I dreamed of bringing this wonderful and unique instrument to a bigger audience! 2. How have you prepared for your recent tour? Are there any particular dates you are looking forward to? The autumn portion of my tour includes a number of concerts as a soloist with an orchestra as well as a premiere of a brand new solo piece, so it's really a busy period focused on preparation for me. I have performed recitals in some very exciting concert halls like Carnegie Hall and Kennedy Center. I believe that any young musician would be very excited to perform in those halls! Both of those concerts were my official New York and Washington debut concerts. Naturally, I have selected a couple of pieces from my Naxos album “On the Path to H. C. Andersen” to perform on these recital programs. As much as they are enjoyable to listen to on the album, I know that these pieces also are fun to perform “live” on stage. 3. What is the public's biggest misconception about accordion music, and how are you looking to change that? How does this perception vary in Europe, Asia, and America? As mentioned before, the accordion is still a new classical instrument from an academic point of view. So, if there are any misconceptions at all, it could be that people do not have any experience on the instrument from concert halls, but rather from the non-academic side of the instrument. By all means, the instrument works out very well within folk music, tango and jazz, but I am sure we will see an even higher level emerge within these styles of music, now that it is possible to receive broader education on accordion. It is also important to me to show the accordion's potential in different styles. Baroque, Classical, and Romantic music works well on the accordion, and I love to perform it. However, since the musical history of the accordion is fairly new, my main focus is to help the accordion establish its own identity as an instrument. Therefore, we need original music. Contemporary composers are fortunately very interested in the accordion, with its expressive, dynamic and unique sound possibilities. Anyone who has heard Sofia Gubaidulina's music for the accordion (or bayan, the Russian translation), will likely agree that it is possible to find colors in the accordion that you can not find in any other instrument. There is a quite big difference in perception of the accordion around the world. In Europe, one experiences the accordion a lot, both in smaller or bigger concert halls, as a part of ensembles, and in most of the important academies. In China, it is a fairly new instrument, with lots of enthusiasm and growing possibilities. However, in America, it is still rare to find accordion in the classical world at all. This of course also goes hand in hand with the accordion's very limited involvement in American music schools, which limits the interest from composers. I look forward to present the accordion as much as possible in the US, since I now have a lot of activity here. 4. In choosing pieces for a recital or performance, what factors influence your decisions? Normally, I think a lot about the diversity of music and how to show the many capabilities of the instrument. For my upcoming recitals, I have chosen to perform Bach, Mozart, Sofia Gubaiduina, Martin Lohse, Astor Piazzolla, and some more virtuosic composers. However, in the future, I also will think more about performing thematic concerts (a Bach program, Russian music for the accordion, etc). For now, I feel it is important to show all the possibilities of the accordion, so that the audience can get an idea of how varied the instrument can sound. 5. What was it like recording your debut album? Any highlights from the recording sessions? It is like a journey through Hans Christian Andersen's fairy tales by music. Like many children in the world, I heard these stories when I was very young. It was eventually a bit serendipitous that the accordion took me to his homeland to complete my studies. The music mirrors a lot of the fairy tales you find in the northern countries, with darkness, light, drama, sadness and joy. Working in this atmosphere, and recording it in his homeland in close cooperation with the composers, was obviously very inspiring. Perhaps the more special moment in the recording was to perform Martin Lohse's “Little Match Girl”, which is dedicated to me, and therefore has a special place in my heart. 6. Of the many awards that you have won throughout your career, which has meant the most to you as an artist? Since I really think that the accordion belongs to the classical music world, I think that the prizes I have received in competition with other instruments means most to me. It is not so easy to establish the accordion amongst top players on strings, piano and voice, but being able to be amongst the prize-winners in the Young Concert Artists’ international auditions in New York (2017), as well as the Societa Umanitaria Musical Competition in Milano (2017) has probably meant most to me. However, I also had a lot of fun for many years in participating in accordion competitions. 1st Prize at PIF Castelfidardo (Italy, 2015), probably was a highlight! To listen to Hanzhi's album, please click here. To view her upcoming performances, please visit here.